Holy Land Hipster: Strike Over! 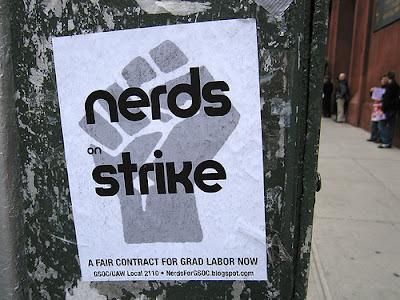 The strike is finally over! That means, it's back to waking up at 7:00 a.m. on Wednesday mornings so that I can make it to class on time. I have no idea what the terms were, nor do I necessarily care, but if everyone is happy then good. Of course, extending the semester by an entire month doesn't make ME happy. In fact, at this rate, my Philosophy final will probably be scheduled for the day of the wedding. And, while I'm sure everyone really enjoyed the nice long break between Pesach and Shavuot, I was actually looking forward to NOT having to go to school in June/July so I could concentrate on other important things like wedding and moving. Oh well, really nothing I can do about it so I'll just sit back and see what happens. Of course, now I actually have to go and do the reading for class on Wednesday. Oy. Today was a quiet and semi-productive day. I cleaned out my fridge and did some light housekeeping, ran some pharmacy errands and then had a minor melt-down. Unfortunately for Mom, she once again bore the brunt of it. I'm tired people. Just really, really tired and last night I was so overtired that I didn't sleep. Not at all. When Buggy called me at 9:30 to wake me, I felt like I had just fallen asleep! I begged him to let me snooze a bit but the damage was done and I got up a few minutes later. I needed a walk and since Tel Aviv is nice and hot but not humid (yet, you know this will be coming soon and with a vengence) so I left my apartment and started to amble. Only, I don't really know how to amble. Living in Manhattan kinda beats that out of you, and so I took off and somehow found myself in front of a salon. I looked at my greasy hair, pulled back into a tight ponytail, and decided why not? I deserve to do something nice for me...And I went in and got myself a blow out, or a Fan as they call it here in Israel. Yotam did a very nice job, even leaving some wave so that I have a little bounce to the strands, and I walked out feeling a little more human. I can't really do much about the bags under my eyes. Hopefully I'll have enough time to put on some makeup before Shavuot starts. It's weird to me to be celebrating only one day of Shavuot. I don't think I'm staying up at all this year - I'm just way too sleep deprived to try that - but Buggy is going to pull the all nighter. He had already mapped out where shiurim he wants to go to and I keep dreaming about hitting the sheets and calling it a night. And, while all my friends and family will be spending the second day celebrating the Chag and gorging themselves on cheesecake, Buggy and I will have lots of errands to run. El Jeffe just called to let me know that he's not coming to pick me up before 5:00 so I'm thinking that gives me plenty of time to get a quick nap in. It would be nice not to bite Buggy's head off out of exhaustion. Poor guy - sometimes I think he's a real Saint for sticking with me. Chag Sameach! Good luck to all you lactose intolerant folks out there and Cousin Neil - this means you!! Don't forget the Lactaid pills!